Ever since Amazon announced the release of an SDK (software development kit) for its Echo interactive speaker early last month, we’ve been salivating at the prospect of using Alexa (Echo’s built-in virtual assistant) as a smart-home factotum. It appears some of the developers with access to the SDK are thinking along the same lines. One such developer is Holland, Massachusetts-based web engineer Jeffrey Bachand, who has come forward with a video of him using Echo to control his Nest Learning Thermostat and Wink smart-home hub. In the 71-second YouTube video, first reported on by Engadget, Bachand can be heard bombarding Alexa with a barrage of commands: “open Wink”, “turn the living room [lights] off”, “open Nest”, “turn it [the temperature] down”, and so on. On each occasion, Alexa does exactly as told. The SDK, as it turns out, came with a nondisclosure agreement (NDA) that has now lapsed, so we can look forward seeing more developers tease their apps. Needless to say, however, Echo owners would like nothing more than to be able to actually use third-party apps like Bachand’s. In the meantime, smart-home owners can use their Echo to control Wemo switches and Philips Hue smart bulbs. 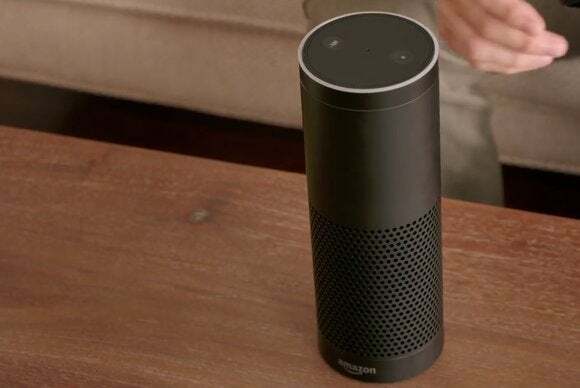 Amazon’s cloud-enabled cylinder boasts a number of useful standalone features as well, including the ability to rattle off news and weather updates, answer questions, control music playback and more.